Big 5 Classic Slot Guide & Review - Casino Answers! Big 5 is a 3-reel, 1-line classic slot machine developed by Microgaming. You can play Big 5 at Lucky Nugget Casino and Nostalgia Casino. “Big 5” is a term coined by big game hunters in Africa. A “big five” animal is one of the hardest animals to kill. The animals consist of the leopard, rhinoceros, buffalo, elephant and the lion. The Big 5 slot machine’s theme is based on these five animals. Symbols on the Big 5 slot machine are: cherry, bar, bar symbol with a “5” on it and the lion. There are only 7 possible winning combinations on the Big 5 classic slot machine. This is a little disappointing, as we definitely would’ve liked to see leopard, rhino, buffalo and elephant symbols as well. We think Microgaming dropped the ball on this. To play the Big 5 slot machine, you must first select a coin value. You can go with the default value of $1 or you can also use $0.25, $0.50, $2 or $5. Once you have picked your coin value out, you can decide how many coins you wish to play (up to 3). To make the maximum bet on your coin value, hit the “Bet Max” button. If you want to change the number of coins, use “Bet One” and then hit “Spin.” Bets on the Big 5 slot machine range from $0.25 to $15 per spin. The top fixed jackpot on the Big 5 slot machine is the lion symbol. 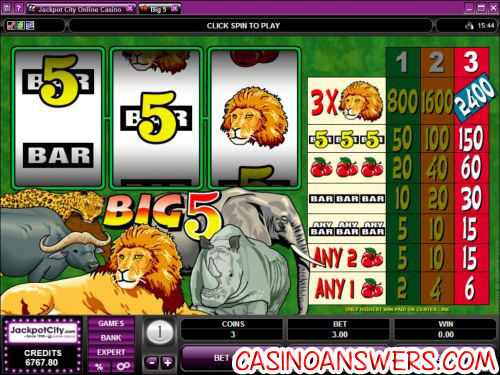 3 symbols featuring the King of the Jungle will win you the 2400 coin top jackpot. At the highest coin value of $5, you can win up to $12,000 playing Big 5. Payouts on the Big 5 reel slot machine are (1/2/3 coin payouts in parenthesis): 1 cherry symbol (2/4/6), 2 cherry symbols (5/10/15), 3 of any bar symbols (5/10/15), 3 single bar symbols (10/20/30), 3 cherry symbols (20/40/60), 3 “Big 5” bar symbols (50/100/150) and 3 lion symbols (800/1600/2400). Hit the “Expert” button to enable the Big 5 slot’s autoplay mode. In autoplay, you can set the number of spins (from 5 to 500), number of seconds between spins (0 to 1.5), to stop when the jackpot is won, to stop if a win exceeds or equals (from $25 to $2500), to stop if credits increase by (from $25 to $2500) and to stop if credits decrease by (from $25 to $2500). You can cancel the autoplay mode on any time. If you wish to speed up the spins, there is a “QuickSpin” mode in the Options. To try Big 5 out along with nearly 400 other online casino games, you can get 1 hour of free play and win real cash at Lucky Nugget Casino! Are US players able to play the Big Five slot machine? Microgaming casinos are not accepting US players and thus are unable to play Big 5 at this time. Americans can find some other great reel slots at Cherry Red Casino and get a 100% up to $7,777 signup bonus while they’re at it. Is there an instant play version of Big Five available? Lucky Nugget Casino has a no-download Flash casino as well as their downloadable software. If you have any problems playing the Big Five Flash game in your browser, make sure you have the latest version of Adobe Flash Player installed on your computer. What casinos have the Big 5 Classic Slot Machine?